Now I don’t know about you, but this is one question that I have always wanted to find the answer to. There are a lot of statements out there; if you wash your hair everyday, your scalp will produce more sebum, and it will get oily quicker; washing it everyday dries it out and makes it brittle; the oil that is produced is good for your scalp….ahhhh! All this just leaves me very confused, with no real answer. So I decided to dig a little deeper and discover if I could find a true answer to this ever so popular question. Phillip Kingsley suggest that daily shampooing is best for the health of you hair and scalp. They explain that this due to a select number of reasons. Firstly, the build up of dirt, oils, sweat and bacteria on your scalp can lead to clogged follicles, which affects the rate at which the hair grows and the general condition and appearance. Secondly, shampooing hydrates your hair, and it is the moisture (water), not the oil, content that keeps hair supple and elastic. ‘Natural oils’ that are produced sit on the scalp, but do not penetrate the cuticle or cortex. 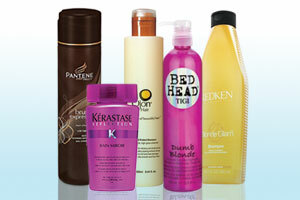 Finally, daily shampooing encourages the use of a daily conditioner, which keeps hair soft, moisturised and tangle free. On the other side of the spectrum, the website ‘Webmd’ state that dermatologists and stylists agree that there is no need to shampoo everyday. They explain further by saying that the hair is a fibre, and the more that you wash it, the worse that it is going to look. Although, the longer, thicker and curlier hair types can go the longest between washes. Schwarzkoph also seem to agree that daily shampooing isn’t necessary. The bottom line? There is no right answer. It all depends on the individuals hair type, and their should be more emphasis on the how you cleanse your hair, rather than how much. It is important to be using the right products for your hair type and making sure that the scalp is throughly cleansed, rather than just sudsing up the ends and drying them out. If you are finding that your current routine is leaving your hair parched, then it may be time to switch up your products! Additionally, it is vitally important to rinse hair throughly after shampooing, (I spend a good 3-5 minutes doing this) as any residue that is left will dull your hair and clog up the scalp. It will also take away the bounce and result in needing more frequent washing. If your anything like me, you will like the volume, bounciness and cleanliness of freshly washed hair, but I know a lot of people who prefer 2nd day hair. My hair type is fine and it isn’t really that thick, but it is quite oily, so I like to wash it every other day. This is the general time for fine-haired people, washing every 1-3 days. And of course, a good dry shampoo is a mush-have and my saviour! They absorb oil and give it back the bounciness of being freshly washed to prolong another day. If you have medium to course hair…(you lucky people! )…2-3 times a week should be sufficient, as it isn’t as obvious. If you feel like washing often dries it out, don’t forget that heat styling plays a big part in hair health. Washing, drying and using straighteners or tongues everyday is a lot for the hair to handle. Remember to ALWAYS use a good heat protector…I like Tresemme Heat Defence…it rocks! All-in-all, wash your hair as often as you feel like you need too. Chose products wisely, cleanse throughly and ignore all of the myths out there! I know I am! After all, you know your hair best and how to make it behave. Hope this helps and let me know what you think! Howdy my lovely followers! How are we all today? All good I hope :). Anyway, today I will be doing a review on the Philip Kingsley One More Day. A good dry shampoo in my opinion has got to be a staple in any hair wardrobe. I am definitely not a morning person and dry shampoos save a lot of time, so I just have to have one in my life. Who else is with me on this one? They fulfil one main function; to absorb oil and extend the time between hair washing by another day….a life saver right!? Philip Kingsley has taken this concept and gone above and beyond in their first ever dry shampoo. Created by the worlds leading trichologists, it is designed to be a hair and scalp treatment as much as it is an oil regulator. They promise that it will sooth, balance and give your hair some va va voom by gently volumising for the ultimate refreshed style. Like all Philip Kingsley products, it is packed full of hair loving ingredients, such as, Zinc PCA; an anti-flake and sebum (oil) control, Allantoin, which soothes and calms irritated and itchy scalps, Bisabolol, an anti-inflammatory which relieves irritation and flaking, and finally, Oryza Sativa (Rice) Starch to absorb sebum and add texture to volumise hair. A lot of benefits huh for one dry shampoo!? Now, I have been using this daily since I got it and I have finally formed my opinion on it. I do like it, but for some reason we just have not connected properly and I am not sure why. I have got to say that this is a super lightweight spray and I do like using it as a style prep on my just-washed hair to give it some extra volume and texture. I give my brush a quick spray, then swoosh through my hair (avoiding the ends). I have quite fine hair and not as much of it as I would like, so any texturizer is good in my books! I also like the fresh, floral scent. It is light and fresh, but no so much that it is overpowering. When your hair is oily, you are advised to spray onto the roots from about 30cm away and rub into the scalp, which does work perfectly. Their are no tell tale signs that you are wearing a dry shampoo, like a horrible white residue. (you will get this with a lot of the cheaper brands) The downside for me is that I feel that you have to use a little too much to get the desired look, which leaves the bottle emptying too quickly! Maybe this is just my hair? Overall, for the price at £13.50 (feelunique.com), I like this product, but would I buy it again? It will probably be a while before I do, as there are plenty more out there that I would like to try first. And as I say, for some reason, I just haven’t fallen in love with it. If you do have quite a dry, easily irritated scalp then this would definitely be a good option to try. Let me know what you think. 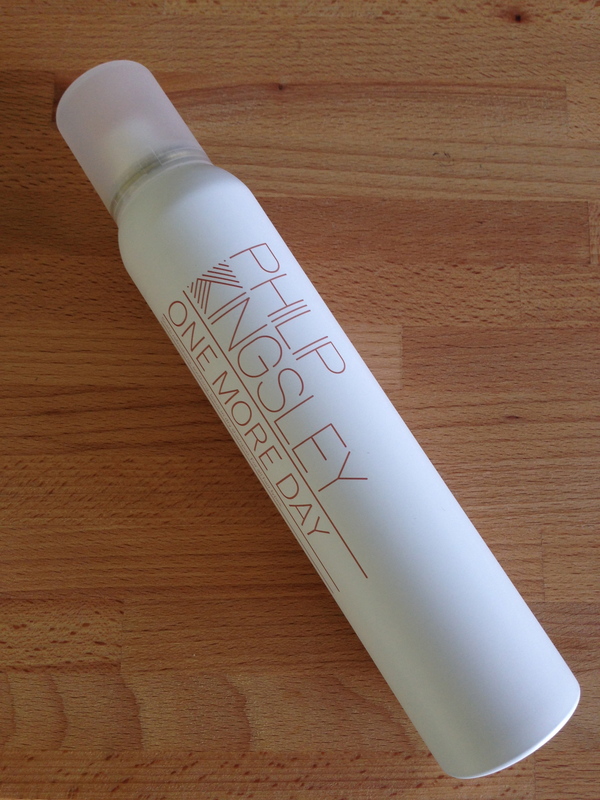 Have you tried the Philip Kingsley One More Day?